Trieste is basically an Italian panhandle stretching 30 miles into Slovenia. After World War I, Italy got a piece of land of the Austro-Hungarian Empire which lost the war. However, in World War II, after losing the war, Italy lost most of the land it conquered in the previous war. Except for Trieste. In 1947, Trieste became an independent city-state but that only lasted 7 years. In 1954, the new, tiny country was divided between Italy and Yugoslavia. This gave the border the strange look it has today. Yes, it sounds awkward but the UK actually has a land border with the EU. Gibraltar is technically a part of the United Kingdom and it has been since 1704, in the war following the Spanish Succession. Spain has been claiming the peninsula as a part of its territory ever since and things might get even more awkward with the UK leaving the European Union. Spain’s borders look pretty normal at first sight but there’s a lot of lands away from the mainland that doesn’t make a lot of sense. Many people don’t know this but Spain has a lot of exclaves on the North African coast surrounded by Morocco. After the Reconquista in 1492, when Spain reconquered the Iberian Peninsula from the Moors Spain occupied parts of Northern Africa too. Known as Spanish Morocco, most of the territory has been given back to Morocco, except for a few dots on the map that keep causing disputes even today. Most of these are remote islands but three of these are actually cities within mainland Morocco. Like these two rocks in the picture which are a part of Spain while everything else is part of Morocco. This 80m wide passage that separates Spain and Morocco is the shortest border in the world. Another exclave is Melilla separated by a 6m border fence separating it from Morocco. 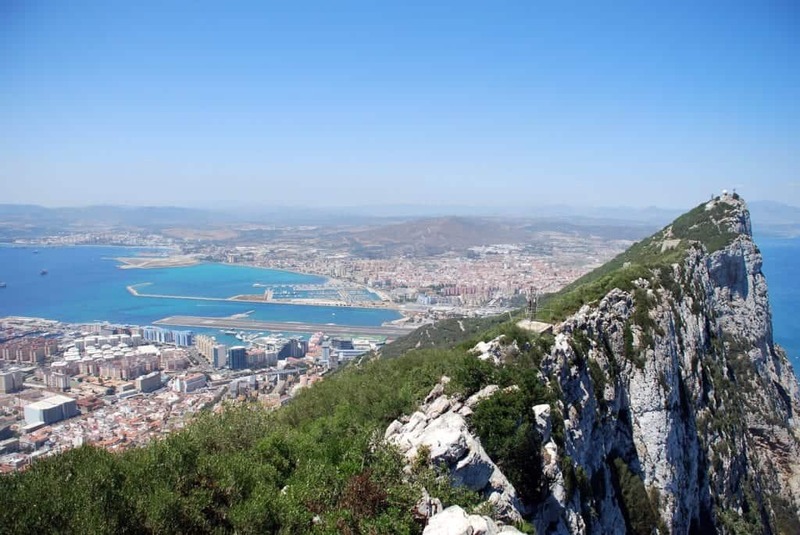 The town is a home to 78,000 citizens and together with Ceuta are the only two towns that belong to the EU but are located in Africa. On a first sight, Cyprus seems like a peaceful, small island but that’s not really the case. There are four entities present at this island. First is the Republic of Cyprus we all know of, the Turkish Republic of Northern Cyprus in the north, two UK military zones, and a UN buffer zone between the north and the south. How did this mess happen? Well, Cyprus was a part of the British Empire till 1960 when it gained its independence. However the British were allowed to hold on to a couple of small chunks of land on the island. Then Greece tried to annex Cyprus but Turkey invaded the island to stop that from happening, capturing almost half of the territory and creating the Turkish Republic of Northern Cyprus. Finally, the UN built a wall to separate the two sides and to serve as a buffer zone. Moreover, Turkey has an exclave in the western tip of the Republic of Cyprus. The Republic of Cyprus has a bunch of exclaves in the UK territory, and one small piece of land is completely cut off from the rest of the country by the military areas. So these people have to go through kilometers of British military zones to get through the rest of the country. I know I made it sound dangerous and horrible but Cyprus is a lovely place to visit, especially the capital Nicosia. Check out this Nicosia guide by Red Fedora Diary if you plan to visit. Located in the Bidasoa River, on the border between Spain and France, Pheasant Island is probably the only island that changes its ownership twice a year. The island is uninhabited and no one is allowed to visit. Pheasant is a part of Spain for 6 months and a part of France for the next 6 months. There’s even a ceremony that transfers the sovereignty of the island between the two countries. This began in 1659 when the Treaty of the Pyrenees was signed on this very island. The island was considered neutral ground at the time since it was in the middle of the Bidasoa that served as a natural border. This is one of the most complex borders in the world. However, both of the countries are a part of the EU so the border is technically nonexistent. It’s about the Dutch municipality of Baarle Nassau and the Belgian municipality of Baarle Hertog. In total, there are 22 Belgian enclaves in the Netherlands and 8 Dutch enclaves in Belgium. 7 of which are counter-enclaves. the streets, cafes, next-door neighbors, and shops. You can even legally park your vehicle in two different countries at the same time. But that’s not all: the border even passes between houses. Hence, some people wake up in Belgium and have their breakfast in the Netherlands, and vice versa. There are several houses in the area that are making lawmakers scratch their heads. The solution that the two countries made was to include houses in the territory of a country according to their front door. Even more interestingly, until recently there was one house in the region that had its door completely divided by the two borders that gave the owner no other choice but to relocate his front door. These were, in my opinion, the strangest borders in Europe. Did you like the article? Do you think I missed some other strange borders in Europe? Feel free to share your thoughts in the comments.